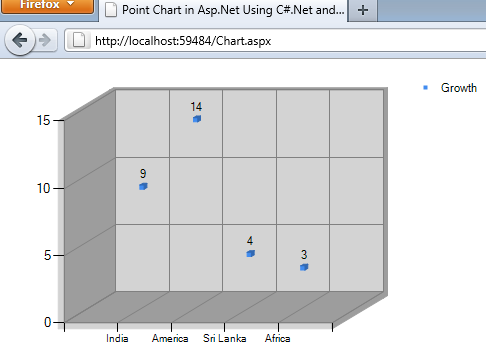 This article will show you how you can create a 3d point chart in your asp.net application using c#.net and VB.net. This will demonstrate to bind the asp.net point chart data with database. 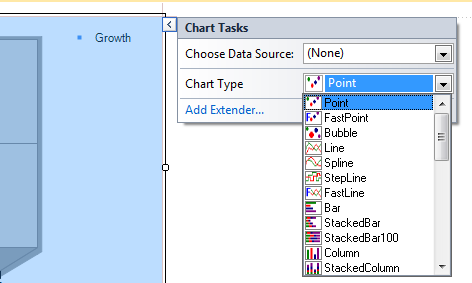 This will show chart control with data without using AjaxControlToolKit Chart control. 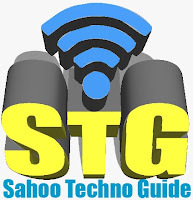 So for this article first we will create a new asp.net application and add the your .aspx page add a asp.net chart control. After adding chart control just set the chart property as point chart. After adding the chart control your code will look as shown below. <%@ Register Assembly="System.Web.DataVisualization, Version=4.0.0.0, Culture=neutral, PublicKeyToken=31bf3856ad364e35"
<asp:Series ChartType="Point" Name="Growth" XValueMember="Country" YValueMembers="Growth"
So for enabling 2d and 3d chart we need to just set the Area3DStyle Enable3D="False" for making it 2D chart. Now let’s cone to code end where we will assign data to the chart control. Here is the C# and VB code as follows. In above code I have first I have prepared the data which is stored in datatable, and then it is pass to the function to bind the data to the chart control. Now we have done run the page and check output.